« Can I take your photo? My Shot on iPhone 6 story continues. This time I have a photograph of mine, which I shot in Berlin last December, in the latest Apple iPhone 6 TV Advert, which aired the U. S last night. Apple is really promoting the camera on the iPhone 6 and it makes me excited to think how great the camera on the new iPhone will be if they are pushing this one so much. You can see my shot in the centre of the screen from the 7th to 9th second. 2 seconds! This shot is one of a series I got back in Berlin last December on one of the main shopping streets. I was in Berlin for a technology in education conference and had been at it all day and the only time I could get out to shoot was in the evening. Berlin in December is cold. The sun sets early in the evening. I can still recall the biting wind. I headed out wrapped up, but without gloves, as I needed to be able to use my fingers to control the cameras. Usually, when I set out on a photo walk, the first while is frustrating. You are ready, super alert and willing with all your might for that photograph to appear. It rarely does. Patience is required. I was about an hour out when I passed this magnificently lit up store front. I had never seen anything like. The brilliant white lines of light against the black of the building. Beautiful. I had found my location. Using the Nikon D7000 I shot some motion blur images of pedestrians and cyclists passing the store. It was OK, but not what I had imagined. It needed something else. I head off, a little despondent. About twenty metres up the road, as I was walking along, I passed this parked,highly-polished black van. A few steps passed it, I stopped and said out loud: hang on, hang on. Nodding my head in excitement, I knew I had to go back. And I was right. There on the side of the van that flanked the road were the reflections of those brilliant white lights. Yes! Click, click. Review – meh! It needed a human element and it needed me to be careful. At times, when I am out shooting I can find myself lost in the moment, unaware of my surroundings or who is around me. 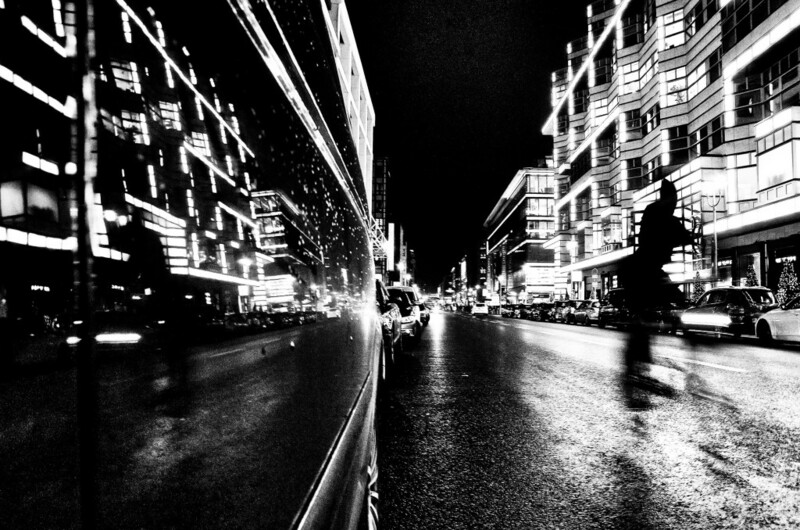 Here I was standing at the side of a parked black van on a busy Berlin street at night dressed all in black. Did I want to get myself killed? No! But I did want to get that shot. I waited and using the Nikon, I shot a few frames with cyclists passing and realising I had ridden my luck, I left. Two or three minutes down the road, I stopped again. I had to go back. I had to get some shots with the iPhone. I did not want to be in a position later regretting lost opportunities. I got back to same position, hung in as close as I could to the van and again waited. In the distance, I saw this guy approaching on a bike. I readied myself and hitting burst mode as he came and passed I got the shots. I could leave. The iPhone does reasonably well in low-lit conditions. I am sure the new release will see great improvements in this area. Comparing it to the Nikon D7000 shot, it does stand up well. 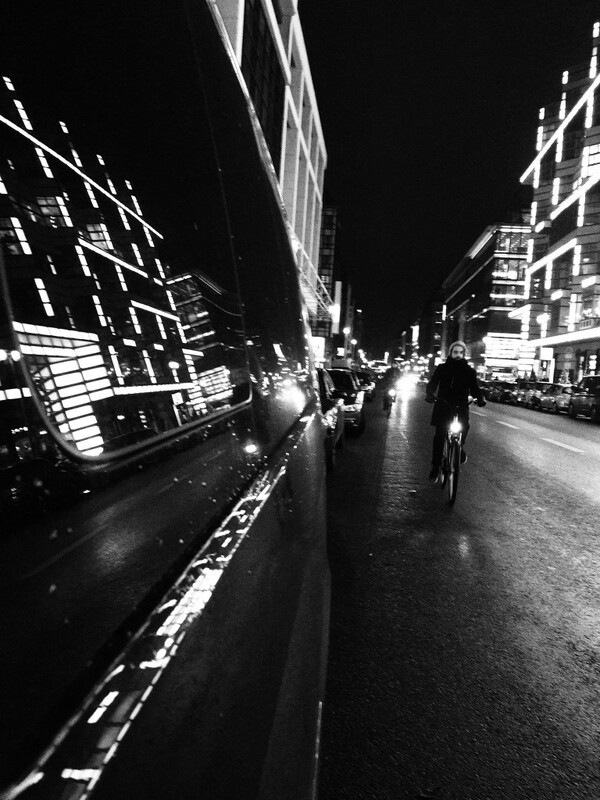 This entry was posted in iPhone, photograph posts, Street Photography, Uncategorized and tagged Apple, Apple iPhone 6 TV Advert, art, berlin, black and white photography, Brendan Ó Sé, Brendan Ó Sé Apple Photograph, Brendan Ó Sé photography, iPhone, iPhone 6, iPhone Photography, photography, Shot on iPhone 6.